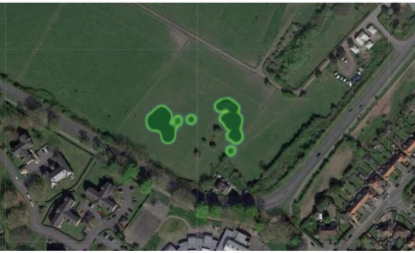 The analysis revealed that the size of field did not influence the distance or speed travelled during grazing periods and that there was no significant difference between the time of year and duration of turnout. However, the distance travelled and average speed did show significant seasonal variation with greater distance and speed recorded in Autumn than Summer. These distances averaged at 7.4km/day in Autumn and 3.7km/day in the Summer. Research on turnout can reveal important behaviour patterns related to the horse’s time budget as time spent at pasture reflects aspects of the horse’s health and mobility, social interactions, foraging behaviour and contentment in their environment (Yarnell et al., 2015). It is also useful to compare domestic horse behaviour to those in a natural state as an indicator of welfare (Veasey et al. 1996). This research investigating the size of turnout has shown little to no effect on the tracked behaviour of horses and the potential impact on welfare. However, the distances covered by horses even at their highest level of activity (Autumn -7.4km/day) are well below those of wild horses travelling up to 28.3km day (Hampson et al., 2010). The effects of reduced movement in humans has been well documented, with implications on weight, joints, physiology and even mental health. Although not as well researched in horses, we recognize the restricted turnout in domestic practices as a contributor to problems with weight management and fluid on the joints etc. 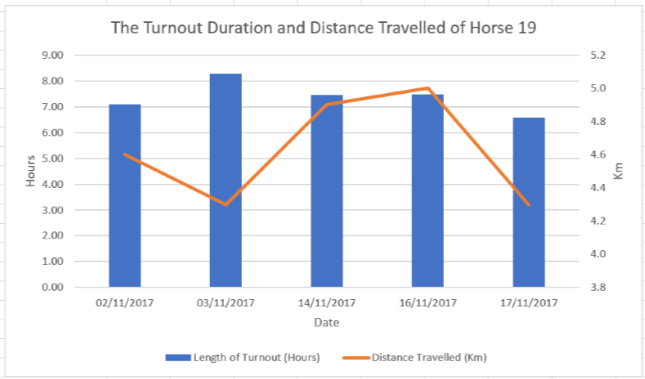 This is something we at Trackener are keen to explore further as we believe there is a huge potential for data driven research about horse’s turnout and its impact on health and welfare. Dataloggers using GPS are increasingly popular for use on other animals to track the behaviour habits and movement of wildlife and cattle and even oestrus patterns in cows, yet have fairly limited use in horses despite the potential capabilities and findings (Titler et al., 2015; Jónsson et al., 2011). 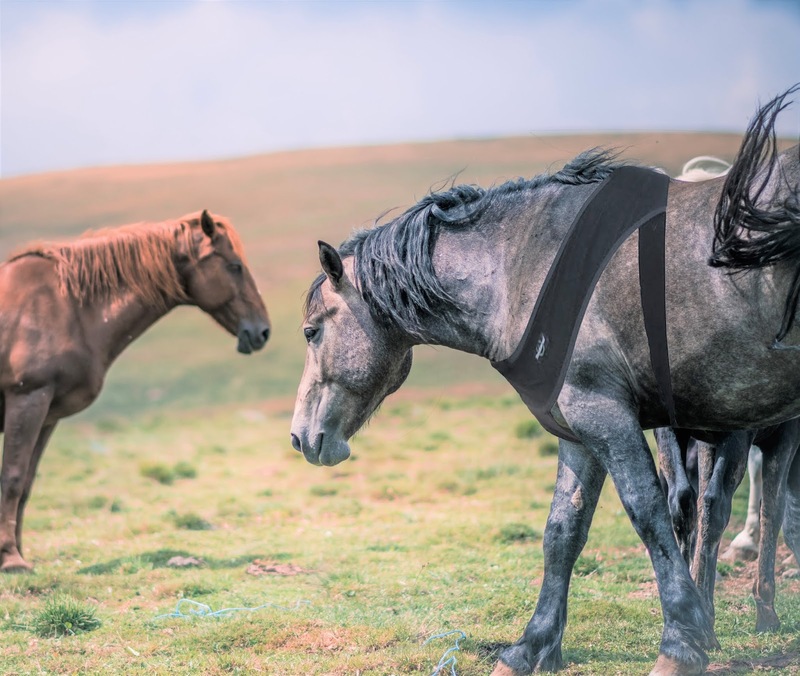 Although this study was a sample pilot with data on horses not hand selected by the researcher, the study produced some interesting and promising results for the future. The potential for more data collected on a larger sample size is exciting, especially as there is an ever-growing demand and speculation around monitoring domestic management practices as welfare concerns rise. Trackener is ideal for collecting data on horses over long periods of time and can be worn during the day and night during turnout or stabling. We are always happy to work with researchers for new studies and research projects. If you are interested in using Trackener for your research, please don’t hesitate to get in touch with us. Kits are available to rent and purchase NOW. To contact Rachel Collins, the supervisor of the project, email here. If you've found this research interesting, let us know what you think in the comments below and feel free to share with friends! Trackener has many more research projects underway. To keep updated with our progress, sign up to our newsletter. Hampson, B. A., de Laat, M. A., Mills, P. C., & Pollitt, C. C. (2010). Distances travelled by feral horses in ‘outback’Australia. Equine Veterinary Journal, 42(s38), 582-586. Jónsson, R., Blanke, M., Poulsen, N. K., Caponetti, F., & Højsgaard, S. (2011). Oestrus detection in dairy cows from activity and lying data using on-line individual models. Computers and electronics in agriculture, 76(1), 6-15. Titler, M., Maquivar, M. G., Bas, S., Rajala-Schultz, P. J., Gordon, E., McCullough, K., ... & Schuenemann, G. M. (2015). Prediction of parturition in Holstein dairy cattle using electronic data loggers. Journal of dairy science, 98(8), 5304-5312. Veasy, J.S., Waran, N.K., Young, R.J., 1996. On Comparing the behaviour of zoo housed animals with wild conspecifics as a welfare indicator, using the giraffe (Glraffa Camelopardalis) as a model. Anim welf, 5(2), 139-153.